Once upon a time, Australian climate scientists discussed and published climate trends of the late 1800s. And lo, the long lost hot weather decades were apparent in many places in inland South Eastern Australia. While skeptics are accused of cherry picking data from Bourke, Rutherglen and Deniliquin, there are plenty of other examples. In the last post, the 1953 Argus story described hotter drier summers in Omeo, Bendigo, Hay, Bourke, Alice Springs, Echuca, Albury, and Cooma. Here is a Deacon et al peer reviewed graph of the long term trends at Hay, Narrabri, Bourke and Alice Springs. But just have a look at this graph. Degrees Fahrenheit of course. State of the art, 1952. Imagine, they even had barometric data from 1880 in small country towns of NSW. There is a lot more data from South East Australia than other parts of the nation. But the CSIRO and BOM don’t seem to be in a hurry to try to calculate the longer trends in those places, where the data is available. There are legitimate reasons why it may be difficult to compare the older trends with the newer data. But it’s a public discussion we need to have. Shouldn’t the Australian public know about all this carefully recorded data, and the very hot summers that happened when CO2 was ideal? the subtropical high pressure belt.
. similar increase has occurred in the Australian region. may eventually lead to an understanding of the causation of climatic variation. of this trend since about 1940 is not yet fully established. I’m glad you got to this stuff before they disappeared it, Jo. Stay safe. Yes. “They” are just evil and we’re so lucky to have Jo (via someone else doing the work) showing the BoM up for the evil-doers that they are. I mean, everything they do or don’t do reveals Jo to be the Saint of Science that she is, God bless her. Please give her some money. Glad you’ve finally come to your senses numbnuts. Poor Chester, still looking for a worthy cause to donate his dole payment to. Seems he has finally found one. Never come across Chester before but he/she seems to be distressed that the truth is being made public. 2. The recent readjustment of this data, which was no doubt accurate and relevant to that particular location on Earth, and to process it into something meaningless and distorted which is used to describe the entire country. Whatever belief system you are using to justify your comments Ches, it is not science and very closely resembles the modern herd instinct evident in that new species (who said there were only extinctions) called Sheeple. Is that all you’ve got Chester? Sarcasm? Ah, back in the days when CSIRO actually did some real science. Then you have Dr. Suess (no, not that one). He was the inventor of Radio Carbon dating and a founder of the University of San Diego who concluded in the 1950s that it was obvious only 2% of the CO2 in the air was from fossil fuel, it must all go quickly into the ocean. Thus the Suess effect. His discovery has since been buried by the IPCC who insist it hangs around, in total contradiction of the fact that you can measure the age of the air from CO2 and the gas equilibrium at the air/water boundary. Fossil fuel, being millions of years old, has no C14. Very simple. So we have become more ignorant, more subject to Science fashion and Science Fiction (Tim Flannery), less rigid and more prepared to alter data to suit our theories. The scientists of the 1950s would be horrified at the idea of ‘homogenization’, the removal of variation to make the data fit the model. You cannot alter data without building in prejudice. As for coming up with fantasy excuses like the movement of measurement stations, whole religions have been built on such chicanery. The Science of Global Warming, Climate Change and Extreme Events is more like a prehistoric religion. Death to the unbelievers. Reliable research shows that natural carbon sequestration takes no more than seven years to deal with new CO2 dispersed into the atmosphere. Plants rise to the occasion; grass grows faster, trees get bigger faster and the amount of vegetation increases in proportion to the extra CO2. Not that this matters much because human origin CO2 does not add to global warming anyhow. I think that a lot of people also fail to realise just how much vegetation is in the oceans, especially in the first several of meters of depth. I would be very surprised if this vegetation was not also gobbling up the extra atmospheric CO2, and feeding the ocean environment as well. Griss because of laziness I also omitted the huge amount of CO2 in the oceans that is neutralised by calcium in rivers and land run off resulting from degradation of land based rocks. I used to know but have forgotten; does all the micro life in the soil use CO2 or give it off? Aerobic bacteria oxidise carbon for energy and give off CO2. Anerobes are made from carbon and release CO2 when they die, most commonly from viruses. Although plants give off oxygen when they photosynthesise, they give off CO2 when they respire. Funguses can be aerobic or anaerobic. Worms and nematodes etc. resemble us, breathing out CO2. The net effect is that dead plant carbon becomes CO2 through the agency of microlife, except for the bit stored in the bodies of the microlife or sequestered in the soil. Its all part of the carbon/oxygen cycle. And some of that carbon in the cycle will always get trapped where it can’t continue, depleting the CO2 level. Depleting the atmospheric CO2 level is the very last thing we should ever want to do if we want life on this planet to survive. All that releasing trapped carbon does is help replenish the carbon cycle. That is the monumental stupidity of the anti-CO2 campaign. We must never allow the CO2 level to drop below 350ppm again..
.. and should in fact be aiming to increase it by as much as is humanly possible. 700+ppm would be ideal and highly beneficial for all life on Earth..
Macro algae consumption of CO2 must be enormous. If we are actually contributing to that rise in atmospheric CO2, then we are doing the whole planet a HUGE favour !! Man made evil carbon DIFFERENT than natural pure gaia carbon!! Also, heat is not temperature!! For some strange reason, some of them might find that unconvincing. I really would love to be able to cite this. Can you give me a reference to the research? It’s already been done to death Lee. I hate summer because whenever the sun gets on my lawn again after hibernating for 6 months it grows like hell. Now carbon catastrophists will tell you that I’m just imagining all this because, as Olaf says above, only gaia carbon can go into grass. This pseudoscience of climate is the greatest hoax since the shroud of Turin. Sorry about the tone of my reply; got out of bed on the wrong side this morning and misread the comment. All I saw was John Cook saying “give me a reference for that”. CSIRO and our “academic elite” stopped doing science decades ago…. They only do politics now. You have to remember – if it is not on data CD it never happened. When I went to school and University to study Science we learned about scientific method and studied many interesting things. The weather or climate was never seen as “science” because it is a variable natural phenomenon which adjusts to local conditions. Climate or weather is periodic and when discussing same it is essential to STATE THE PERIOD BEING DISCUSSED. From dawn to dusk to dawn we have a 24 hour period: the temperature differential in many locations on the planet can be quite extreme in this short time. We have four seasons of about three months each during which temperatures and “weather” change dramatically. There are other periodic rearrangements every 13,000, 26,000, and 110,000 years. Sadly for “CO2 did it” type Climate Science all of the above periodic weather changes are directly the result of variations in orbit of the Earth around the Sun ; ie Orbital Mechanics did it; not CO2. Although I do not believe that the temperature variations over the last 100 years can ever be used as evidence of Global warming or Global Cooling the fact that Climate Scientists want to make an issue of this type of stuff is really interesting in that it exposes their real fears. What number do you want it to be? It’s all just applied mathematics / engineering once you understand the concepts behind it. How to design drainage systems when you don’t really know how much water there might be. So rainfall changes change average temperatures!!!. Somebody please ring the BOM! who prefer to use ‘the site might have moved’ and such like to explain anomalous temperatures readings. The hubris and ignorance is breathtaking. So, much of inland SE Australia cooled in the early 20th century but the experts just can’t or don’t want to understand this, so they just change it instead. The ‘international organisations which we should all align our data with’, caught out not doing their proper groundwork. Great stuff. The elite centres of excellence and hubris all missed this. Jo, great work, this is the kind of Real Life Detail along with Newspaper articles that Steve Goddard has found that debunks all the catostrophic pronouncements about the USA weather. There must be hundreds, if not thousands of such documents for Australia and Europe that show that their is absolutlely nothing “unprecedented” about any for the 20th or 21st century weather. Oh you mean the cooling in the USA that James Hansen told us about? Empirical evidence does not lend much support to the notion that climate is headed precipitately toward more extreme heat and drought. Probably the most sensible thing he has ever said. Jo, your comment about barometric records gave me a thought. Barometric records are not a proxy for temperature, but may be for overall climate patterns. High pressure is associated with warm, dry, sunny weather in summer, and clear, dry, cold weather in winter (in the Northern Hemisphere, at least). Conversely, low pressure is associated with cooler, wet weather in summer and milder, wet weather in winter.If the same holds generally true for Australia, and if Melbourne, for example has experienced alternating periods of cooler and wetter versus drier and warmer summers, i would expect a corresponding variation in barometric records, independent of temperature records. The position, size and persistence of seasonal high and low pressure areas has a large impact on weather. In the Northern Hemisphere, large high pressure systems form in the Arctic regions every winter. Their location and movement varies with the waves in the Jet Stream. Last northern winter, a very large high formed and persisted over northern Canada for weeks. The relative positions and strengths of highs and lows determine the direction of winds and the tracks of storm systems. Last winter’s high caused large amounts of cold, dry Arctic air to flow south into central and eastern Canada and the U.S. for weeks, resulting in a long and bitterly cold, severe winter. This year, the pattern may repeat, or the shifting Jet Stream may cause a high to form and remain stable over western Siberia, for example, sparing North America but subjecting northern Europe to a severe winter. remains to be seen. Yes, there really is no mystery to any of this, is there. In a similar vein, this article on El Ninos and coral bleaching exposes as a lie the Left’s attempts to blame ‘global warming’ for coral bleaching. High pressure systems in the central Pacific and lower pressure in our tropical coastal waters means weaker trade winds, less cloud cover, calmer water and therefore warmer surface temperatures, which leads to mass bleaching of corals. This article is also of interest, particularly as concerns the speed of recovery of reefs from bleaching events. In both of these articles there are contrary views. One of the contrarians uses the old ‘Does smoking cause cancer?’ line. Of course, when you hear that, you know the debate has ceased to be on the science. The Left are desperately hoping for an El Nino this summer so that they can start talking up global warming again. If you can find them, there are also articles around about the speed of recovery of the reef at Lady Elliott Island, I think it was, from the damage caused by a ship that ran aground there a while back. You may also recall the Left’s hue and cry at the time about the danger of shipping inside the reef. D’oh, I meant lower pressures in the Central Pacific and higher pressures in our tropical waters. A thought. 1952 was in the days long before the weather was a politically sensitive issue and involved a billion dollars a day. No one had any reason to homogenize temperatures. If someone measured the temperature, that was the temperature. There was no reason to believe otherwise. So in less politically charged times when academics were not in such hot competition for prestige and research money, they were actually discussing things in a calm cool-headed manner. No! Not really. We once valued our character above our personal benefit, at least a lot more than I see now. I don’t know exactly when things began to slip but I suspect it started to accelerate with the advent of instant mass communication. If this thread points out anything it is that I was correct back in the past a little ways when I said the real problem was one of the human heart. If we can change the attitude that brought us to this current situation then we can reverse the situation. Otherwise it surely will continue. It began when gentlemen ceased to wear hats and ladies stopped putting on white gloves to go to town. Soon afterwards we began altering the nature and names of public service institutions – the PMG became Telstra and Australia Post and stopped purchasing from AWA. The final nail was the death of the Anthony Hordens tree. Something like that. Mainly when ‘public service’ was usurped by ‘user pays’. Mainly when ‘public service’ was usurped by ‘user pays’. You are certainly right about that. I’m getting ammunition together to make a fight against the County Board of Supervisor because of their recent position that homeowners should pay for sidewalk repair in front of their homes. The sidewalk is a public right of way and has been historically the responsibility of the local government entity, in my case, the county. At least one member of the board claims that it has always been county policy. Too bad I’ve been here for a long time and can point to repairs I know were made by the county and can say it was done in response to my call to public works complaining about the bad condition of the sidewalk. Public service has definitely suffered. Good luck, Roy, hope you have a win. Fortunately we have an ally on the board. The supervisor representing the district where all the affected people live is on our side of the fight. Unfortunately she’s only one vote. But having her help may prove to be essential. If they are saying the sidewalk is yours Roy, rip it up. Saves maintenance. And I think Gary in Erko is almost correct, but I would say that User Pays is a result of that thinking, not the cause. I think the cause could be more accurately attributed to governments that waste money, impoverish the nation and create depressions. It’s when the people don’t have money to spare that they start missing payments. This is where User Pays as invented. When society could no longer support the maintenance of public infrastructure. Boy would I ever love to rip it up. I’d plant cactus just to teach them a lesson. I’d also no doubt end up in court. And that’s where the problem is. I have no control over it and I’m taxed to maintain public facilities of all kinds, yet I have to fork over money out of pocket on demand and the repair of course, has to meet county specs. I can’t even tint the concrete green. Governments that waste money though — I’m not so sure about that. Why would my government waste money? Certainly not. They have to save every penny to support all those illegals coming into the country from Mexico. When I lived in Sweden, I was horrified to discover that it is the householder’s responsibility to clear the snow from the footpath in front of the house. However, as far as I can tell, that has been the policy since before Gustav Vasa, so it isn’t a new cost-cutting measure. During most of the last year I was in the army I was responsible for the basic maintenance in the building we lived in. When it snowed I was out early in the morning shoveling off the steps, the walkway to the street and then I went to work shoveling out all the cars parked in front of the building. Then along would come the city snow plow and plow it all back in. Then I had to do it all over. The problem about this was that the plowing schedule wasn’t reliable, they sometimes beat me to it and sometimes came around twice. So I had to shovel snow regardless and then wait to see what happened. Five Days a week I had to be on duty by 8:00 AM, so if anything needed doing after that everyone was on ther own until I was off duty again. As you know, shoveling snow is back breaking work. So I don’t miss the snow a bit. I’m a Southern California boy all the way when it comes to weather. If I really want snow I can easily drive up any number of mountain roads to get it. Doing the same thing over and over, expecting different results? Come to Queensland Roy, California weather and the local council will maintain your path for ya. Roy,if that sidewalk has a wheelchair ramp on either end of your block, ask the board which citizen installed it. Public walkway, public works. And check your plat; you may not own that bit of ground. In my subdivision, my corner pin is about 12′ set back from the street due to county right of way. I can’t do squat with the frontage other than cut the grass. Naturally caused latitudinal shifting of climate zones. Such shifting being the negative system response to thermal imbalances however caused. Good work Jo! In addition to the antics of BOM, what’s really interesting is that these temperature trends appear to be just the opposite of global and Northern Hemisphere trends for 1880-1940. Jennifer Marohasy pointed this out to me at the ICCC-9 meeting in July. I wondered if this was a local phenomenon or characteristic of the whole region, so I looked at the advance and retreat record of the Fox and Franz Jozef glaciers in New Zealand, both of which are fairly sensitive to short-term climate trends. Both show advance/retreat trends similar to the Australian temp record for 1880-1940. Why is the climate down there seemingly out of step with the rest of the world? So my question is: if you extend the temp record from 1940 to the present, what does the combined curve look like? (I’d look it up myself, but don’t have easy access to temp records there). What do the NZ temp records show for 1880-1940? Are they similar to Australia’s? Don, the longer trend for most of the towns named above is for warming from 1950 – 2010. So unlike the US where there was a peak in the 1940s in the raw data here, there was a dip to the 1940s across a wide part of Eastern Australia then a recovery back to hotter weather. At a guess the ENSO driven rainfall matters a great deal to the Eastern half. The higher temperatures are partly due to dry soils. Rain on Australia mean dryness on the East Pacific — which would show opposite cycling. FWIW – the West Coast of Australia seems to show a long term slow warming – a different pattern. The west coast pattern has closely followed deforestation and land clearing. I was recently on the Sunshine Coast, where I previously lived in the 80′s. The climate, particularly rainfall, has changed significantly due to clearing of rainforest. About eight years ago, there was an internet report on a US team of scientists who came to Australia to study the fact that Australia’s rainfall suddenly halved about 50,000 years ago. It was an intriguing story which has since completely vanished from the internet. The aborigines arrived suddenly at that time across land bridges from Africa with low ice age sea levels, with their dogs and their one gift of fire. The megamarsupials all died quickly, the giant wombats and emus, all at this time. Perhaps hunting, perhaps fire, perhaps destruction of vegetation. Even Tim Flannery came to this obvious conclusion. The other conclusion was that the vegetation had changed completely and suddenly and so did the rainfall. So it is possible that the invasion of aborigines destroyed this fragile infrastructure, which might explain why the story vanished as politically unacceptable. More importantly it gives reason to hope that man could reestablish water as in Israel and so reestablish the vegetation and actually change the weather? After all, if man can really change the weather, shouldn’t we? The AGW is all about stopping everything, not harnessing it, not debating that if we could change the weather, what we should do with this power? That is not the Green way, which is self hate and destruction and reversing the advance of man, even turning the earth into a deity which fears change. This does explain earthquakes and volcanoes though, God’s anger. You would not think such people would have massive political power, but that is the reality of minority governments. How many scientists actually work outside the government in countries like Australia and the current UK or pseudo government organizations like NASA? Umm…sorry to partially spoil your story, but there were no land bridges to Africa or Asia. The aborigines had to use boats or rafts to cross the deep water between Bali and Lombok (Wallace line). They could then have followed land and reached Australia via PNG. It would seem that there were waves of immigration, but some megafauna went extinct before humans arrived. As for re-greening I have a book by Bradfield & Idriess which advocates dams in Nth. Queensland and sending the water down to Coopers Creek. Evaporation would cool surrounding lands (helping water retention in soil) and then condense on the west side of the Great Dividing Range increasing river flow into the inland. I guess how they arrived is less important than when, which is well known and the fact that they changed the place, the flora, fauna and possibly the rainfall. For the middle of Australia, there are many interesting ideas for water collection and redistribution, things we should be talking about. As for aborigines and boats, I have never seen anything more advanced than a dugout canoe, which would not cross open ocean. How did they get to Tasmania. Even today the areas between Australia and the land masses are relatively shallow across the Arafura sea with huge tides. Lower the water 100 metres and you would be able to get from the England to France, from Australia to Tasmania and from Northern Australia to the Indonesian archipelago. Maybe a raft at best. The flooding of the black sea, around 5300 years ago, the biblical flood was also a direct consequence of the 100 metre sea rise after the ice age. Ocean going boats are also very advanced technology, beyond most. Even big islands like New Zealand and much of the Pacific were completely unpopulated one to two thousand years ago before development of advanced catamarans or proas. I believe Europeans arrived in NZ only hundreds of years after the Maoris, not thousands. Even Taiwan was near unpopulated until the Dutch arrived. Personally, I think the aborigines in Tasmania for example were utterly trapped by rising waters and did not have boats at all. I am happy to be wrong, as it was not my point and only secondary to the effects of the arrival of the first carnivore mammals, aborigines and their dogs. I guess the requirement for at least rafts is confirmed by what did not come to Australia. Marsupials had developed in Australia quite independently of mammals for millions of years. A land bridge would have meant the wholesale destruction of the marsupials, especially the megafauna. Ergo, no land bridge and the Wallace line. However there is a huge difference between boats as we would know them and just things which float over relatively short distances on calm seas or can be paddled. The question though is whether the arrival of man actually changed the ecosystem so much that the rainfall halved. That gives hope that it could be restored by dare I say it, direct action. The other thing which indicates a one way trip for aborigines are the obvious differences between aborigines and say Torres Stait Islanders or natives in PNG and Irian Jaya. However aborigines arrived, their floating technology was one way only and a very long time ago, 40,000 years before the discovery of the wheel or agriculture but after the discovery of fire and the burned pointed stick, Professor Blainey’s favorite human discovery. The Tasmanian aborigines did not have purpose built wooden boats, but did have bark canoes which they used around Flinders Is., Hunter Is., and Bruny Is. They did not make it to King Is. which is a good half hour in a Cessna past Stanley and over much deeper water. Interestingly enough their diet changed from eating pelagic fish to shellfish somewhere around the time they were cut-off from the Australian mainland by rising seas. I guess their diet was mainly shellfish, birds and marsupials as there is little in the way of edible native plants. Good outline. The other obvious factor in the weather 50,000 years ago would have been the very definite movement at that time into the big ice age which peaked right in the middle about 25 kya. G3 mentions above that there does not seem to have been a land bridge to Australia from Asia but as others point out the distances across Island hopping are not great. The main land bridges from PNG and Tasmania to the mainland can be picked up on Google Earth if you look at depths in those spots. Anything shallower than about 119 metres is a possibility once peak cooling occurred 25kya. I was wondering if the move to the big freeze had some special effect on climate which cut back on water to the ares being mentioned. KK, I do not know. Maybe water distribution was not uniform, but glaciers were all with 40 degrees of the poles. Rather perhaps the land masses are moving. In parts of Northern Sweden there is an uplift of 1 metre per century and elsewhere a few cm. The land is springing back after the weight of km of glaciers was removed. Then you have continental drift and tectonic plates. 50,000 years is 500 centuries and a movement of even 10cm per century, 1mm per year would be another 50 metres, so order of magnitude, we probably do not know how deep these channels were, but they were clearly too deep for animals. Birds and insects made it across but little else except man and his dog. There are pictures of boats in caves in the Kimberlies. I have read these are off limits, but they suggest various boat people have come and either died or more likely been hunted down. Looking at some records for the Sunshine Coast indicates that there has been a slight trend of increasing rainfall at least since about 1900. Record rainfalls occurred in 1898 & 1893. From about 1900 to about 1915 was the Federation drought which on the Sunshine Coast was most severe in 1905. The 1893 was due to a cyclone known as the “Mooloolah” Event (recorded by Inigo Jones) which caused flooding not only on the Sunshine Coast but also around Brisbane and north to Gympie, Maryborough and Bundaberg. The Sunshine coast and Burnett area are due for another cyclone. The 2011 Brisbane floods was a combination of record rain in December, slightly above normal heavy in January and poor operation of water release from dams (due to stupid political interference of politics fueled by bad advice from AGW alarmists). There was no cyclonic conditions (such as 1893) on the coastal area at that time. Old photos (1890′s to 1930′s) of the Sunshine Coast area show that much more land had been cleared for agriculture than at present. Even allowing for building development there are now more treed areas than in the past. This may be having an affect on rainfall. Sydney’s used to be 45.3C in 1939 iirc, now its 45.3C (as recorded by the AWS) in 2013 ie no warming in 74 years. “Sweltering Sydney records hottest day at 45.8C: The Australian January 18, 2013 3:17PM. SYDNEY is sweltering through its hottest day ever, setting a new city temperature record of 45.8C just after 3pm. The automatic weather station at Observatory Hill only recorded a maximum of 45.3C. No-one has yet explained where the extra 0.5C came from. It is thought that someone went out and opened the Stevenson screen to get a reading… OOOPSY !!! The other option is that the temperature was rising for the few steps before 3:10, then falling after 3:20, and someone fitted a curve that peaked at 3:17. So that’s how they get the new maximum for Sydney, is it? They estimate it, then assure the world that the science is un-contestable. Do their [dubious scientific methods] know no bounds? All I know is that when I looked at the AWS summary the next day, it said maximum of 45.3. I wish I still had a screen capture of it. And I did email BOM asking for an explanation, and got no reply. That’s exactly what I meant to say, but in my frustration I couldn’t find the right phrase. Cooling from 1853 to 1900. Keep in mind that the 1909 – 2009 portion (see below) was subject to adjustments that were found to introduce a trend over that period that was too steep (0.91 C/century vs 0.34) i.e. the mid 1800s were probably very similar to 1970 onwards. Warmth in the mid to late 1800s is apparent in the raw CliFlo records (e.g. Dunedin). “Our new analysis confirms the warming trend” – NIWA. Well yes it does, if you throw out the earlier data – raw or adjusted, and use a linear trend. A 3rd order polynomial trend of that graph shows cooling from 1909 to 1926, warming 1926 – 1995, and flat thereafter. Thanks heaps for your work trying to keep the ******* honest !! I know when it started to slip and that was when George Bush (the elder) wondered if there was global warming and raised the annual federal budget for all things to do with the weather from approximately $600,000,000 to $4,000,000,000. With all that extra cash to find global warming they found it and will continue to find it until the money tap is shut off. The weather news was intriguing this week. Australian is a big country and the drought is not over in South West WA. Perth is dependent on desalination. So what makes news? Terrible high winds in Perth and SW WA. Planes flipped. Trees down. No one mentioned the rains right across the area. Perth is a hot, dry area so these rains are wonderful news and a sign that the fundemental randomness of rain activity in such a dry area is shifting and perhaps Perth will get good spring rains. However, that is not newsworthy. Only the negativity, the doom and gloom stories which sells. How much planning are we doing for the next drought. After all, you are only ever between droughts. Look at the stark contrast of a scientist reporting on observations in 1952 to what we get in the MSM today, the character of the person will always come through in their actions. Once great scientific institutions are reduced to stenographers of propaganda infiltrated with stupidity and greed, we now get disaster chasers with all the morals of an ambulance chaser but with a far bigger retainer and cult renown. I think Figure 1. demonstrates the fallacy of homogenised site data quite clearly. If those three are cherry-picked, then there should be stations at the opposite end of the spectrum whose trends have been just as strongly altered from heating to cooling. Let some BOM boffin produce a list of three stations for which this is the case. What is an “ideal” level of CO2? Did you mean what the warmists mean as lower than it is now? Looking at all the information on your site it looks to me that a CO2 level a bit higher than it is now would do my vegetables the power of good! This is the message we have to start getting out there. A good start would be 700+ ppm. I’ll work on that! Would running my central heating system in my Blue Mountains home flat chat all year help? Come to think of it, Griss, I wouldn’t mind a couple of extra degrees to get my growing season going a few weeks earlier too! Try hydro, the yields and quality are both much better. Just so long as the plant has those tiny trace elements that are needed to make proteins, amino acids etc. Only some plants can get the nitrogen from the atmosphere, All the other little bits and pieces must come from the soil or the growing medium. But mostly, PLANTS NEED CO2 and H20 !!! more CO2 = MORE plant growth. !!! Ban Ki-Moon might be wishing he could move the Climate Summit to warmer climes! 11 Sept: USA Today: Floods, snow hit central U.S. Snow is also possible in the Denver area later Thursday and early Friday. Frost and freeze warning are out for parts of Washington, Idaho, Montana, Wyoming, the Dakotas and Minnesota. Temperatures are forecast to drop to as low as 15 degrees near Butte, Mont., which is a temperature more typical of mid-November. It is hard to accept that plants are made 99.9% from H2O and CO2 only. There is almost nothing left when you burn wood. Most people have grown up with the concept of “good soil”, the “terroir”, “fertile river plains and valleys”. Good soil may have trace elements, but that is all a plant needs. Water holding and mechanical support are required. Given good water and good drainage, CO2 and sunshine, you could grow crops anywhere. Perhaps a bigger problem would be too much salt, harsh drying winds and matching the plant to the climate for things like evaporation, salt in the air, drought resistance. So plants are just solid CO2 and water. So yes, more CO2 will mean more plant growth. You have to think that when the earth was hotter and wetter, when dinosaurs roamed, more CO2 came out of the oceans and the forests were incredibly lush, laying down the coal and oil and gas which powers us and which will run out soon enough. Man did not make carbon or coal. They are not industrial pollution. However to reverse the logic and blame minor planetary temperature rises on old solar energy captured in plants is almost perverse and unlikely to be true. Things were fine under the dinosaurs who ruled the planet for 150million years, not 10,000 years. Perhaps Clive Palmer has a point at his steamy Coolum resort surrounded by dinosaurs or perhaps he just feels at home? Maybe you might want to rephrase that…. its the sort of comment a common troll might make. btw, Please take that comment above with a smile. Yeah, as the Celestial Mechanics guys used to say, “that’s close enough for Astrohysics.” We know what you meant. Not a lot of paleontologists dropping in here. My favorite period was the Plasticene. They were large, fearsome but strangely malleable. Can’t help but notice the usual suspects haven’t popped up to dispute this post – must be because the evidence is indisputable and they can’t fudge and obfuscate as they do normally. Rutherglen 82039 Max 01/01/1950 Statistical* 0.63 82053 72023 82001 82002 75028 75031 80043 72000 72150 80015 1949 inspection report said site was overgrown, possibly cleared? -0.63, -0.59, and -0.49 adjustments made but for no documented reason. Amberley Min 01/01/1980 Statistical -1.29 adjustment, again for no documented reason, turned a raw cooling trend into an adjusted warming trend. But no corresponding adjustment to Max? Modelling Australian and Global Temperatures: What’s Wrong? Thanks Richard, what I don’t see there is documented evidence that Rutherglen has moved. It’s good to have a list of stations used, but these are almost all statistical “moves”, not necessarily real ones. We are doing research on Amberley behind the scenes and it does look like the site moved, but this is the kind of historical investigation the BOM ought to have done. Why are they more interested in speculative statistical guesses than doing the hard yards with real research? Why do they pretend the Australian temperature “records” are so accurate and indisputable when they must know how large the changes to the real data are, and how much guesswork is going into those adjustments? Surely they are also aware of the long hot records in some locations from older 1880s and 1890s historic data? Yes exactly, BEST does the same by their Scalpel method but to the mean instead of Max and Min. I cannot see how an adjustment can be made without some known local reason no matter what the statistical breakpoint analysis might turn up. To their credit NIWA does not do this for NZT7, adjustments are only made for known reasons. But did the move coincide with the breakpoint in Min? And even if so the move is odd because there’s no adjustment to Max but the -1.29 adjustment to Min is radical (huge), and changes the trend from negative to positive. Not one of these NZT7 adjustments for any of the 7 locations (i.e. not just Wellington) reverses the trend from negative to positive as BOM’s Amberley Min adj does. This is a minor (and perverse) contention compared to BOM’s -1.29 Amberley adjustment and trend reversal. An overstated trend by NIWA but certainly no trend reversal even for a location where the largest valid adjustment occurs for the entire NZT7. Given the above, NIWA’s adjustments are relatively benign compared to BOM’s. Houston, we have a Trans-Tasman problem. When I lived in Mildura I met a grape farmer outside Wentworth NSW who wanted to engage in the ongoing debate about the Murray that was raging at the time (circa 2005). Flannery had just come out and said the Murray would be dried up in 12 months and Mildura and surrounds would be basically uninhabitable, he then proceeded to drive a tinny down it and make some cash from the ABC. Anyway this gentleman told me his grandad had a painting on the wall of his house that depicted bullock teams dragging massive hardwood trees down the dry bed of the Darling near Wentworth, his idea of the date was circa 1910-1920. The painting no longer exists because it was destroyed in the Wentworth floods of 1956. His point was basically…. Probably 1914 or 1915. This was the Murray river at the time. Well there ya go. Nice link well done. That’s more or less the situation he described as lived through by his Grandad. You might like this link then . 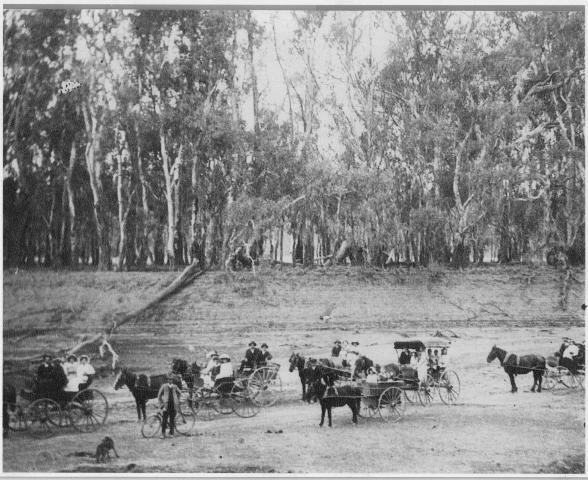 A few years ago a chap (over 80) said his uncle described riding a horse to school in summer and crossing the Murray on dry land. Would have been around 1900. Downstream of Waikerie, and possibly near Swan Reach in SA. Probably 1901/02 at the end of the Federation drought. I know this may look like I’m changing the subject here, but bear with me because this is actually a similar situation, and it deals with perception. I get into no end of trouble when I use (The Industry Standard) the average yearly output of differing versions of renewable power, and convert that to a Capacity Factor, and note there I mention the yearly ….. AVERAGE. I’ll quote 30% for Wind Power, around 28% for CSP, and 13% for Solar PV, and that also equates to Rooftop solar power. So, where I then extrapolate that back to the Nameplate, and mention how it is always so low, that’s what gets me into trouble, especially when I mention that rooftop solar yearly average of 13%, which means that even though the Nameplate might be around a seemingly huge 3200MW, that then devolves down to a yearly average of only 420MW total, with only 250MW fed back to the grid. Those last two figures are what gets me into trouble. Renewable urgers and fans flame me without remorse for doing that, because at certain times of the Summer, between the mid daylight hours, rooftop solar (so they actually believe) is actually providing quite a lot of power, so they are told, (incorrectly) and then from that, form their belief that rooftop solar is good. Okay then, let’s then look at their belief with respect to temperatures. As someone earlier mentioned, EACH DAY there is a minimum temperature, and there is a Maximum temperature. They are what they are, the low, and then the high. From that they then find an average for that day. From every day across the year, they then find an average temperature. They then add up all these averages, homogenising some of them along the way, and if you look at it seriously, isn’t this averaging of everywhere and lumping them all together a total form of homogenisation. From all those averages they then overlay them with earlier yearly averages and find that, hey, the average temperature is increasing albeit by (what they say) tiny fractions of a degree. See now, how that is an okay thing for them to do, and they point to that as their absolute. The average of averages of averages, producing an overall. And yet, when I use an average, that is totally and utterly misleading. They have their own rules, and perish the person who uses those same rules for the opposite side of their argument. I can see the response from those warmists now. Hey, that’s an entirely different thing altogether. I see Putin has tested a new ICBM. Nothing like a good Cold War and threat of nuclear conflagration to take away fears of pleasant weather. The whole discussion about feedback is irrelevant because carbon dioxide does not raise the Earth’s surface temperature – it cools it (by about 0.1 degree) for the same reason that water vapour cools it by about 12 degrees. We know this must be the case because the so-called wet adiabatic lapse rate (that is, the gradient of the plot of temperature against altitude) is less in magnitude than the dry rate. This lowering of the gradient is caused by all molecules of any gas which radiates at the relevant temperatures found in any planet’s troposphere – anywhere in the universe, because physics is universal. Radiation can only transfer thermal energy from warmer sources to cooler targets. Radiation from the cooler atmosphere to a warmer surface does not have its electro-magnetic energy converted to thermal energy in the target. In other words, any such one-way passage of radiation obeys the Second Law of Thermodynamics. It is an independent process, not dependent upon any radiation the other way. Often there is no such radiation. For example, the Sun’s radiation penetrates the water in a stream and heats the sand on the bottom. That sand may not be radiating back to the Sun. Now this means that, in the troposphere, the only transfers of thermal energy by radiation are from warmer to cooler molecules, in other words, usually upwards towards space. Radiating molecules act like holes in a blanket. They help thermal energy escape more quickly to space. Water vapour introduced between double glazed windows reduces the insulating effect as it helps energy leap frog the slower moving thermal energy moving by diffusion across the gap. So inter-molecular radiation always has a temperature levelling effect, and so it reduces in magnitude the gravitationally induced temperature gradient that occurs because of the process described in statements of the Second Law of Thermodynamics. Hence, because water vapour reduces the thermal gradient, the whole thermal profile rotates and so it intersects the surface at a lower supporting temperature. This has been confirmed in my study of temperature records from three continents. The atmosphere is warmed by conduction from the surface whether it be land or water. GHGs such as CO2 and water vapour assist the conductively warmed atmosphere to radiate energy to space directly instead of first having to return it to the surface in adiabatic descent whereupon it would radiate to space from the surface instead. GHGs therefore enhance cooling from within the atmosphere which weakens convective overturning so that the surface radiation directly to space reduces by exactly the same amount for a zero net effect. That is why energy out to space always matches energy in from space subject to variations about the mean caused by internal system variations such as ocean cycles. For a non GHG atmosphere all radiation to space would be from the surface. For an atmosphere that is 100% radiatively efficient all the energy to space would be lost from within the atmosphere. The radiative efficiency of an atmosphere bears an inverse relationship to the proportion of energy lost to space directly from the surface. note my proposition for the [current] drop in global maximum temps. It seems there is some correlation with fig. 1? from the seventies we switched to continuous recording (every second) with thermo couples as opposed to human observation recording a few times per day (4-6 times, if you were lucky and nobody got sick or had to go on leave) with a thermometer. Now interestingly, the first evidence of a re-calibrated thermometer I could find is 1948. It would seem that before that time thermometers were manufactured and never re-calibrated….. It is the orbiting Solar induced ‘Dry’ Cycles that govern temperature and ‘precipitation’. Nothing to do with the fantasy of ENSO.